Solar photovoltaic (PV) systems are quite possibly the most common type of renewable energy systems. ?Feed-in-Tariff? programs are being adopted by more and more places around the globe, paying individuals a handsome rate for the electricity that they generate from a renewable source. This demand is encouraging PV manufacturers to streamline production and distribution which the consumer is seeing as a reduced price for PV panels. The cost of PV panels has dropped significantly in the last 5 years from approximately $4/watt to around $1/watt, or less. This reduced price, and resulting increase in sales, has boosted other areas of the solar industry, increasing demand for inverters and for batteries for off-grid systems. This, in some places sudden, increase in the demand of solar PV grid-tied and off-grid systems has sometimes caught the local installation sector unprepared. At first glance solar PV systems appear to be very simple, after all, we?re talking about sunlight and a black, glass panel, how complicated can it be? And, in many cases, installing a solar PV system is fairly straightforward. The confusion is in the design and the lack of knowledge regarding how solar PV panels produce electricity. Only after the PV system is installed, and the performance of the system can be observed, does a poor design start to rear its ugly head. Optimizing a PV system requires a look at the design. Specifically, verifying voltages, inverter compatibility and array orientation. Most existing systems can be made to work very well just by changing how the PV panels are connected together. The single most common mistake that IÂ’ve seen is with incorrect string design, resulting in the PV panels operating at a voltage level far less than their optimum range. PV panels work sort of like an LED, but backwards, you shine light into them and get electricity out. They have no moving parts and are therefore very reliable. Most manufacturers offer an unheard of warranty in any other industry, guaranteeing 80% of their rated output after 25 years. But PV panels have a limited power output, and they work best over a narrow voltage range, or point, called the Maximum Power Point. Figure 1 shows, in blue, the IV curve on which PV cells operate. At a PV panel?s maximum voltage, Open Circuit Voltage (Voc), it will produce no current. At a PV panel?s maximum current, Short Circuit Current (Isc), it will produce no voltage. Power is the product of voltage and current and we want a PV panel to operate at the point on the IV curve where it will produce its maximum power. 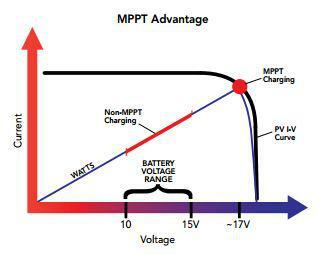 This voltage level, Maximum Power Voltage (Vmp) is crucial when designing PV strings, especially for off-grid systems. Inverters and charge controllers are available with a Maximum Power Point Tracking (MPPT) function. This forces the PV panels to operate at their MPP in any light condition. MPPT is most beneficial in off-grid systems because PV panels that are connected to a voltage source, like batteries, will operate at the voltage level of the source. If a PV string is not designed so that the Vmp is matched closely to the battery voltage much of the power that the panels could generate is wasted and it appears that the PV array does not work. And even then, the voltage of lead-acid batteries varies depending on their State-of-Charge (SoC). 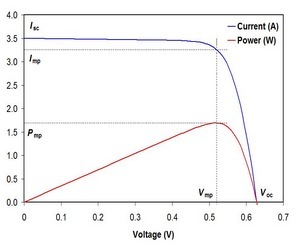 Figure 2 shows the loss of power of a PV panel with a Vmp of 17V if it is connected to a 12V battery. Depending on the SoC of the battery the PV panel could be generating as little as 50% of its potential power. Panels connected in series, increasing the string voltage, will compound the problem. Other problems with voltage arise for grid-tied systems. Grid voltages are not constant. They can fluctuate a great deal, especially if there are industries close by that are high power consumers with cycling loads. The grid voltage can reach as much as 10% or more above the nominal voltage. These high voltage levels can put the grid voltage above the maximum output voltage for some inverters. When that happens the inverter can no longer push the power out onto the grid and it may turn itself off until the grid voltage returns to a level within the inverter?s output range. Some options for correcting this include, buying a new inverter that has a higher output voltage, adding a transformer between the inverter and the grid to step the voltage up, or to request that the electrical utility check the grid voltage and make adjustments at the local transformer. PV string voltages for grid-tied systems must be designed to be below the inverters maximum voltage level, taking into account the increased voltage output during the seasons where outside temperatures will be below 25?C using the PV panel?s Temperature Coefficient. But string voltages must also be as high above the inverters start-up voltage as possible to maximize the array?s power output. By maximizing the inverter?s start-up voltage the inverter will turn on sooner in the mornings and on overcast days, and will turn off later in the afternoons, resulting in more generated power. Another consideration for optimizing PV arrays is to check the array?s orientation with regards to tilt and azimuth. While this seems to be the most basic consideration, it is surprising how many arrays are not mounted at their best orientation. An exception is that PV arrays mounted on sloped roofs should adopt the roof?s orientation for structural and aesthetic reasons. The old rule-of-thumb of mounting PV panels with a tilt equalling the latitude of their global location is actually only correct at 2 latitudes on earth. But it is within about 5% of the best angle. There are many free software programs or smartphone apps available to determine the best tilt for your location (PV Watts by NREL is one). With almost no exceptions an azimuth of 180? True South will be the best azimuth in the Northern Hemisphere and 0? True North the best in the Southern Hemisphere. Mother Nature can throw a wrench in this mix however if you live in an area where it snows. A tilt of less than 30? will not allow snow to slide off of the PV array. Depending on the PV manufacturer, the tilt may have to be as high as 40-45? to allow the array to shed snow. Many PV manufacturers which are located in snow prone areas are incorporating specialized glass textures and coatings specifically to aid in shedding snow from the PV panels. Solar energy is the most abundant form of energy on Earth. It is available to every location on the planet and can easily meet all of the energy needs of mankind. Optimizing a PV system can turn a bad design into a productive one and applying optimizing techniques to an original design will create a PV system that will produce so much energy it will surprise many of the nay-sayers.